lmost all of the drawings on this site are the work of Ted Drake, the official illustrator of the Kuklapolitans. Ted's interpretations of the Kuklapolitans are noteworthy not only for his sure line and strong graphic appeal, but also for his unique ability to capture the essence of Burr's characters - sometimes in just a few simple strokes. 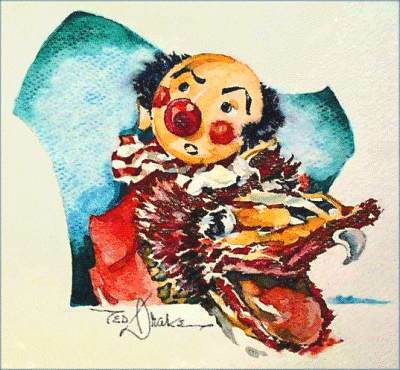 And Ted was not afraid to draw the Kuklapolitans as puppets, seams and all. Just as Burr somehow convinced us that these pieces of cloth were dear friends, Ted's drawings walked the fine line between fantasy and reality. 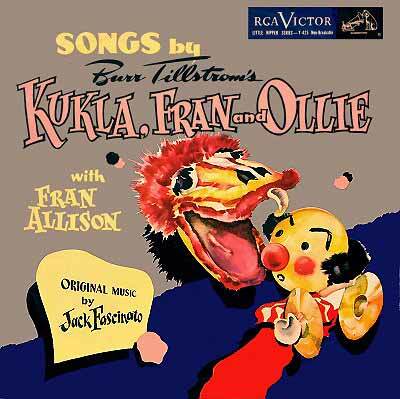 It's easy to see why Burr wanted no one else to draw the Kuklapolitans, and why he used Ted's art extensively, from the opening titles of the show to album covers, newsletters and advertisements. 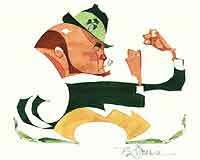 Mr. Drake has had a long and varied career since working with Burr, designing the famous logo for Notre Dame's "Fighting Irish" football team, and painting many commissioned works for the Professional Golf Association and others. He continued to paint throughout his life. Early in 1999, Ted consented to an interview from his home in Indiana. I'm pleased to present it as part of the history of the Kuklapolitans. Update: I'm sad to report that Ted passed away on May 25th, 2000. He will be missed by KFO fans everywhere. Thanks for taking the time to answer a few questions for your fans, Mr. Drake. I'm happy to - but mind you, I haven't rehearsed! Well, I'm pretty new at this myself....why don't we start with when you were born? I was born in 1907 - that makes me 91 years old. Yes, I try to work everyday. Were you born in Indiana? Yes, right near here - this is Elkhart and I was born next door in Goshen, Indiana, a few miles away. But I've always lived right here in this area. Did your interest in drawing start as a child or later in life? No, as a child. Actually the first thing I can remember drawing - I just vaguely remember it - but I've been told that at the age of four, a neighbor came over. They were planning a St. Patrick's Day party and they wondered if "little Theodore" - that was me - could draw them an Irishman. That's the first thing I remember drawing. That's kind of prophetic, isn't it - seeing as your most famous creation is the Fighting Irish leprechaun for Notre Dame? Yes, isn't that kind of strange that that was the first thing I did? Probably the thing I will be most remembered for, if at all, is that little leprechaun. Hopefully, you'll be remembered for your work for "Kukla, Fran and Ollie," too. Yes, that would be nice - I was a great admirer of Burr and Fran and that show. How did you meet Burr? Had you worked as an illustrator before the Navy? No, I hadn't. I'd never been able to find work in the field of art, which I love. I made my living in other ways, working in a New York Central Railroad foundry here in Elkhart. So you had no formal training? No - that's the way it worked. And Jack introduced you to Burr? Yes, Burr and Jack were both in Chicago at that time. I had come home to Elkhart after the war, and Jack got in touch with me and wanted me to meet Burr Tillstrom. We got along well, and I did the first little job for them, and he liked the way I put his characters on paper - he said no one else could do that. Did you watch the shows live to get a feel for the characters? A lot of them - I'd be in there maybe once a week, and I'd always call on Burr and his gang - Fran, Beulah Zachary, Jack Fascinato - all great people. So you were still living in Elkhart? Yes, I'd go to Chicago when I was needed, about once a week or so. I was also working for Wilson Sporting Goods at the time. When did you begin working for Burr? Well, I got back home in '46, and I imagine in '47 I was working with Burr. He was a very comfortable, down-to-earth sort of person. Easy to communicate with. He knew, of course, just what he wanted, but he wasn't demanding in that sense - in the way you might imagine he would be. We got along smoothly. You did the opening credits for the show as well? Yes, I did. I remember that Burr thought that no one else could do his characters, so I did everything. The Nabisco people, who were a sponsor at one point, brought me to New York a couple of times to work with them when they used the Kuklapolitans in their ads. I can't be precise - maybe the late 50s. When they began to clamp down on the Kuklapolitans. Someone with a lot of brains thought that they were taking over television too much and they cut back on the Kuklapolitans. Right - first they cut them from a half-hour to fifteen minutes. Yes, that sort of thing. When that began to happen, my phase of work faded along with it. I can't remember that there ever was a breaking point, it was just that they no longer had a need for an artist's work in the things they were doing. Did you save any of your work from the show? Not much. 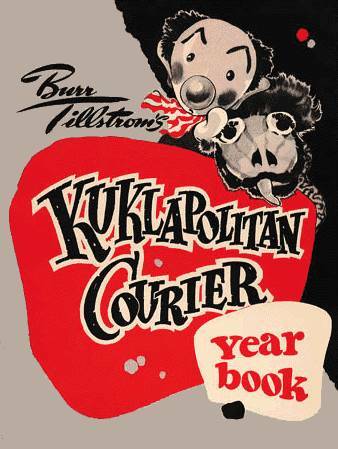 I do have a copy of the Kuklapolitan Courier Yearbook. I'm very pleased to hear that people are still interested in the show. They are - even people who are too young to have seen the show in the 50s. I first saw Burr when he was performing at the Goodman Theatre in the early 80s and fell in love with the Kuklapolitans immediately. You know, that was the show's charm - you'd think it was done for kids, but adults tuned in the show every night. When it was at its height, it was as much an adult show as a kid's show. When I watch some of the shows from the 50s, I'm impressed at how sophisticated the humor is. Yes, in a quiet way. He didn't press you with sophistication, it just came off that way. Did you get the sense that he was trying to speak to adults with the show? No, I didn't. All I can think of now is that what he was trying to do was to say what Burr Tillstrom had to say - in his quiet, unpretentious way. Oh, yes - and Adlai Stevenson. He was a great fan of the show. It impressed me that he cared about the show. Are you still painting the Kuklapolitans? Actually, I've just finished a painting of Kukla and Ollie - my first in many years. Can people contact you if they'd like to arrange a commission? Certainly - there's even a page on the web with information. Great, I'll add a link to it. Thanks for giving us a little peek into your time with the Kuklapolitans, and I look forward to seeing more of your work!